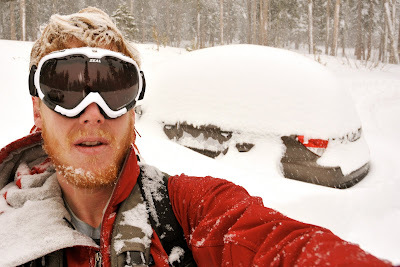 California has a great system of Sno-Park parking lots at trailheads of winter recreation areas. Parking in these lots requires a small fee, which fortunately means that CalTrans is responsible for plowing the lots of a regular basis (though only after they have plowed all other areas deemed to be more important, such as highways and byways). After several days of heavy snow, I decided to see if the sno-park had been plowed and make sure my car was still visible to plow drivers who might not notice its presence under a mountain of snow. The Sno-Park had been plowed and my car was not entirely buried. I took the opportunity to shovel it out and relocate within the parking lot for an easier getaway on the 22nd.